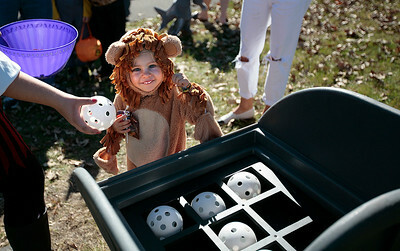 Kyle Grillot - kgrillot@shawmedia.com Lilly Donnelly, 2, of Cary plays a game during the Trick or Treat Trail at Lions Park Saturday in Cary. The costumed children walk to different stations where they can play games to get prizes, treats, candy or trinkets. "It's an alternative to the traditional trick or treating of going house to house," said Park District Spokeswoman Katie Hughes. It's also a safe and family friendly festive event, Hughes said. 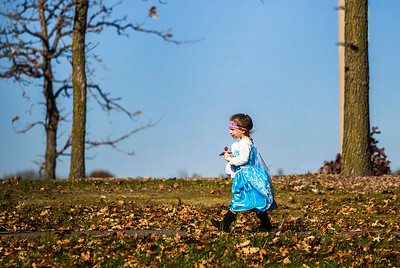 Kyle Grillot - kgrillot@shawmedia.com Olivia Araiza, 3, of Cary carries her lollipop while walking the Trick or Treat Trail at Lions Park Saturday in Cary. The costumed children walk to different stations where they can play games to get prizes, treats, candy or trinkets. "It's an alternative to the traditional trick or treating of going house to house," said Park District Spokeswoman Katie Hughes. It's also a safe and family friendly festive event, Hughes said. 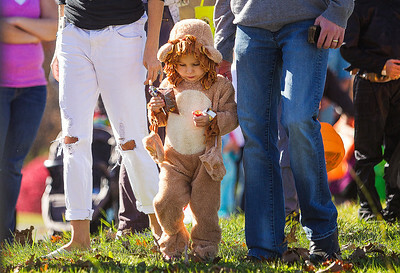 Kyle Grillot - kgrillot@shawmedia.com Lilly Donnelly, 2, of Cary walks with her parents during the Trick or Treat Trail at Lions Park Saturday in Cary. The costumed children walk to different stations where they can play games to get prizes, treats, candy or trinkets. "It's an alternative to the traditional trick or treating of going house to house," said Park District Spokeswoman Katie Hughes. It's also a safe and family friendly festive event, Hughes said. Kyle Grillot - kgrillot@shawmedia.com Joe Bybee of Cary holds his daughter Peyton, 2, while she observes a toy she received at the Trick or Treat Trail at Lions Park Saturday in Cary. The costumed children walk to different stations where they can play games to get prizes, treats, candy or trinkets. "It's an alternative to the traditional trick or treating of going house to house," said Park District Spokeswoman Katie Hughes. It's also a safe and family friendly festive event, Hughes said. 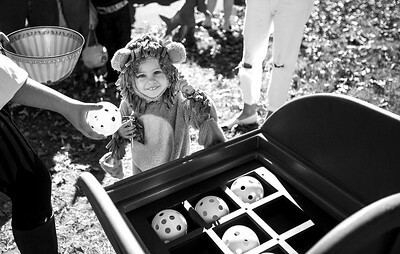 Lilly Donnelly, 2, of Cary plays a game during the Trick or Treat Trail at Lions Park Saturday in Cary. The costumed children walk to different stations where they can play games to get prizes, treats, candy or trinkets. "It's an alternative to the traditional trick or treating of going house to house," said Park District Spokeswoman Katie Hughes. It's also a safe and family friendly festive event, Hughes said.